Final cuts have begun to take place as the Giants finalize their 25-man roster over the next few days leading up to Opening Day. Joey Bart is the teams top-prospect and had shined in his first spring camp with the organization. 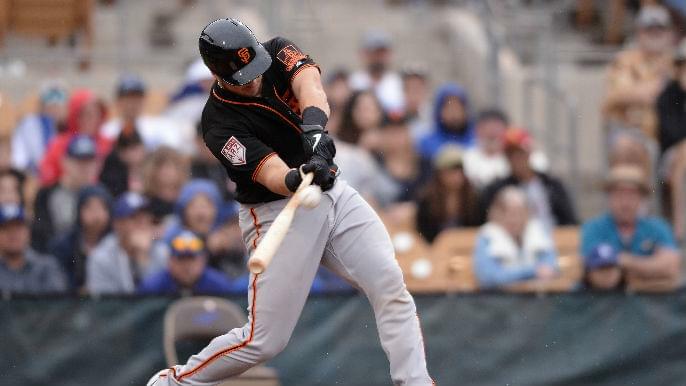 The Giants reassigned Joey Bart to minor league camp. He’ll open season with San Jose Giants. Drew Ferguson cleared waivers and was returned to Astros. The move to send Bart down was expected and does not come as a surprise to anybody. Putting together one of the most impressive camps from a prospect in recent memory, Bart hit .350/.381/.600 with a home run and seven RBI’s. The future replacement for Buster Posey not only shined at the plate but behind the dish as well. Bart will begin the season in High-A San Jose, but could easily finish in AAA Sacramento at the pace he’s on now. The exciting catching prospect has grabbed the attention of everybody in the organization, and it won’t be too long before he’s playing in San Francisco. In addition to reassigning Bart, the Giants have returned Rule-5 pick Drew Ferguson back to the Houston Astros. Ferguson who was in the mix for a backup outfield spot had a rough spring and was put on waivers just yesterday. The opening day roster is beginning to take shape, but position battles are still on-going. The Giants have a split-squad day today, followed by one last game in Arizona on Saturday before returning home.